When she’s not saving lives, ace Firefighters Lucy Mcloud is adventuring! Joel (Intrepid Events) met Lucy on an advanced medical course near Wales recently where amongst a group of ex-military guys she was a clear leader and inspirational character. We can’t wait to see her on the The Great Escape this summer and I’m certain she’ll give the guards a run for their Deutsche Mark. 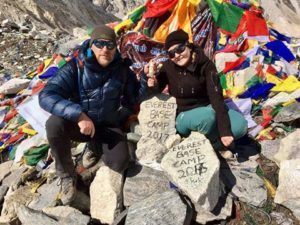 Lucy recently returned from an Everest where she used the same Pits and Bits waterless body wash we are using on the Great Escape. Not content with mere expedition rambles she got engaged on the slopes of Everest too!